Have a question about the game? Need a translation of a skill? Ask it here. I am curious if Cham's support coin is just "large dodge up on attacker", or something different. I don't get, for instance, if it is any better than using the Tessa support coin which is "large dodge up and attack up". That Tessa one is pretty old by now and required a 50 OMG pull to get, so maybe it makes sense? Oh, here's a thing. Anyone have a list of the Battleship abilities? The Wiki doesn't have that portion. (06-26-2016, 10:20 AM)OmegaZero Wrote: Oh, here's a thing. Anyone have a list of the Battleship abilities? The Wiki doesn't have that portion. Is it Ok, I make a new Post, my last one is over a week old. 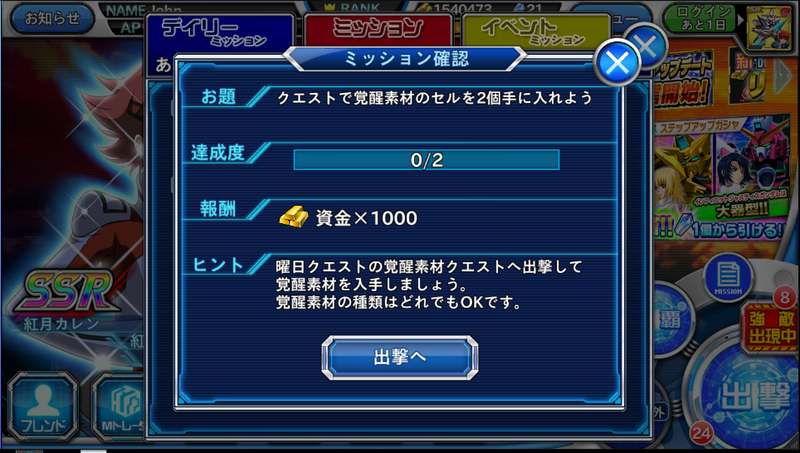 What is the requirement for new daily mission?